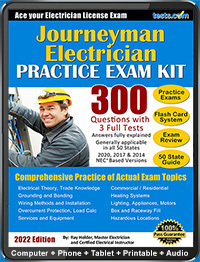 Find Journeyman Electrician Practice Exams and other resources to help you get your electrician license. 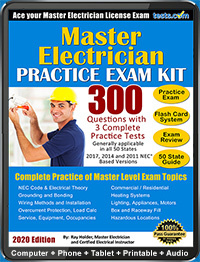 Our electrician exam practice questions reflect topics on actual state electrician license exams. For more information visit our Journeyman Electrician License Exam Review. A practice book of electrical calculations designed to give a clear and concise review of the basics of solving mathematical problems. 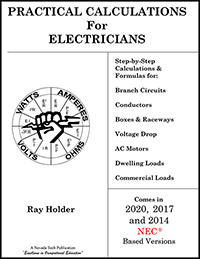 - exerpt from Ray Holder's complete Journeyman Electrician Practice Exams with fully explained answers for ideal study. The following tests help to prepare students for the electricians' licensing exam. It will not make you a competent electrician, nor teach you the electrical trade, but it will give you an idea of the type of questions asked on most electricians' licensing examinations and how to answer them correctly. Most electrical exams consist of multiple-choice questions and this is the type of questions reflected in these tests. The questions will give you a feel for how many of the examinations nationwide are structured. The questions are an example of the many questions the author has encountered when taking numerous licensing exams in recent years. Begin your pre-exam preparation with two points in mind. Opportunities in life will arise - be prepared for them. The more you LEARN - the more you EARN. Attempting to take an exam without preparation is a complete waste of time. Attend classes at your local community college. Attend seminars, electrical code updates, and company sponsored programs. Many major electrical suppliers and local unions sponsor classes of this type at no cost. Take advantage of them. Become familiar with the National Electrical Code(r);; the NEC(r); has a LANGUAGE all its own. Understanding this language will help you to better interpret the NEC(r);. Do not become intimidated by its length. Become thoroughly familiar with the definitions in Chapter One; if you don't, the remainder of the NEC(r); will be difficult to comprehend. Remember, on the job we use different "lingo" and phrases compared to the way the NEC(r); is written and to the way many test questions are expressed. Generally, electrician license candidates may not sit for an examination without submitting a completed license application (with all required documentations and applicable fees) to the state agency in which they are applying to take the examination. If the candidate is approved, they will be notified that they can schedule their examination. Applicants will also be informed if their application is incomplete or does not satisfy the required criteria. Most states require an applicant for the journeyman electrician license to have 8,000 hours (4 years) of on-the-job training under the supervision of a master or journeyman electrician and pass a journeyman electrician examination. The examination is usually a 4 hour, 80 question, multiple choice test. Generally, an applicant for the master electrician license must have 12,000 hours (6 years) of on-the-job training under the supervision of a master or journeyman electrician, hold a journeyman electrician license for 2 years, and pass a master electrician examination. Many states do require this criteria if one has a degree in electrical engineering. The examination is usually a 5 hour, 100 question multiple choice test. Please be advised, it is recommended that you first contact the state where you are applying for you license, because their specific requirements and criteria may vary. When studying, get into the right frame of mind, and relax. Study in a quiet place that is conducive to learning. If such a place is not available, go to your local library. It is important that you have the right atmosphere in which to study. It is much better to study many short lengths of time than attempt to study fewer, longer lengths of time. Try to study a little while, say about an hour, every evening. You will need the support and understanding of your family to set aside this much needed time. As you study these licensing exam preparation tests, the NEC(r); and other references, always highlight the important points. This makes it easier to locate the NEC(r); references when taking the actual exam. Use a straight edge, such as a six-inch ruler when using the NEC(r); tables and charts. A very common mistake is to get on the wrong line when using these tables; when that happens, the result is an incorrect answer. Use tabs on the major sections of your NEC(r);, so they are faster and easier to locate when taking the exam. The national average allowed per question is less than three minutes, you cannot waste time. A common reason for one to be unsuccessful when attempting to pass electrical licensing exams is not knowing what to study. An electrician must be licensed. Licensure typically requires the passing of an exam. 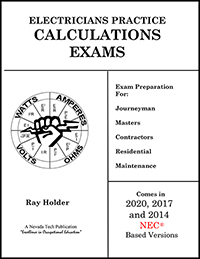 Learn more about the exam with our Journeyman and Master Electricians' Test Guide.